Here's a presser on their upcoming presentation of Press For Truth. Except that Breitweiser does not appear in the film except in old TV clips, and the other three widows are actually the stars of the show (in addition to Bob McIlvaine). Following the attacks of September 11th, a small group of grieving families waged a tenacious battle against those who sought to bury the truth about the event -- including, to their amazement, President Bush. 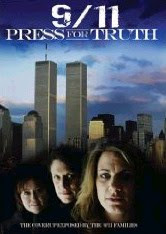 In this documentary, six of them -- including three of the famous 9/11 widows known as the "Jersey Girls" -- tell the powerful story of how they took on the greatest powers in Washington, compelling lawmakers to launch an investigation that ultimately failed to answer most of their questions. The filmmakers collaborated with the media group Globalvision (WMD: Weapons of Mass Deception, Beyond JFK) to stitch together overlooked news clips, buried stories, and government press conferences, revealing a pattern of official lies, deception, and spin. As a result, a very different picture of 9/11 emerges -- one that raises new, and more pressing, questions. And if you pledge $104 to these Rocky Mountain Oysters, you'll get a DVD of PfT plus In Their Own Words, all the crappy questions that they had to pull out of PfT because they were even more ridiculous and embarrassing than the ones they left in. But wait, there's more! If you send another $50, we'll send you David Ray Grifter's The New Pearl Harbor! Oh, we can tell that KBDI is an exemplary PBS network, representing the Rocky Mountain spotted feverish contingent proudly. And if you are delusional enough to part with 304 bones to the nutbar network, you could actually get 5 DVDs plus two books. The added DVDs are Blueprint for Truth by Box Boy Gage, Fabled Enemas by Bermas, and a DRG lecture from 2007. Why mention the added book (a Peter Dale Scott snoozer), nobody's going to read it. What a sad, pathetic little station KBDI is.